Members of the Blue Mountain Battalion salute those lost in the attacks. Photo by Carl Socolow '77. Rain drops on the trees above set the somber tone as members of the Dickinson College community gathered on the John Dickinson Campus to pay respects to and honor those lost in the Sept. 11, 2001, attacks. 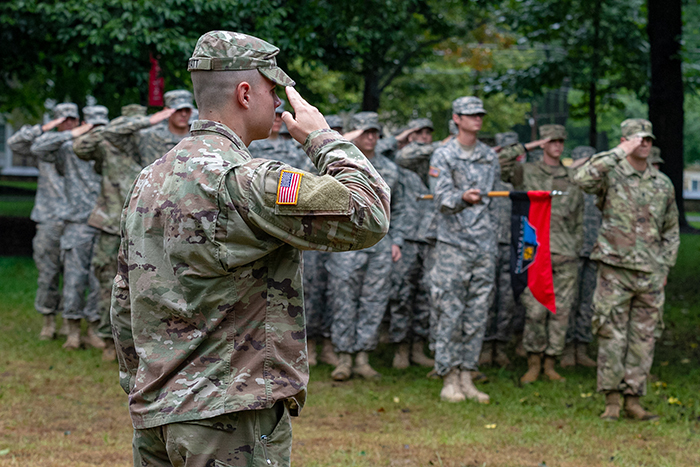 The college's Patriot Day observance was organized by the Blue Mountain Battalion Reserve Officers' Training Corps (ROTC) and included the playing of "Taps" as the flag was lowered to half-staff by the ROTC color guard. A red, white and blue wreath was laid beneath the flagpole by President Margee Ensign, who offered a few words of remembrance. Asha Tran '20 (music) performed "Amazing Grace," followed by a remembrance prayer led by Rev. Donna Hughes, director of the Center for Service, Spirituality and Social Justice, at the close of the ceremony. President Margee Ensign carries a wreath to the flagpole. Photo by Carl Socolow '77.